Hello everyone… Christmas is getting closer and closer! And Today I have one more card to share with you. It is a fun fold card. For the front card I decorated it with one of the Snowflake Season patterned papers. I added gold glitter on the swing panel, then stamped imaged on it. Then I added some die cut snowflake crystals on the corner. To decorate the inside card, I used the negative die cut from the snow crystals as stencil, Victorian Velvet distress ink and make-up sponge to some snowflake randomly. Then I added some die cut snowflake crystal on some of the big ones for extra layer on the snows. I also stamped the sentiment inside the card. 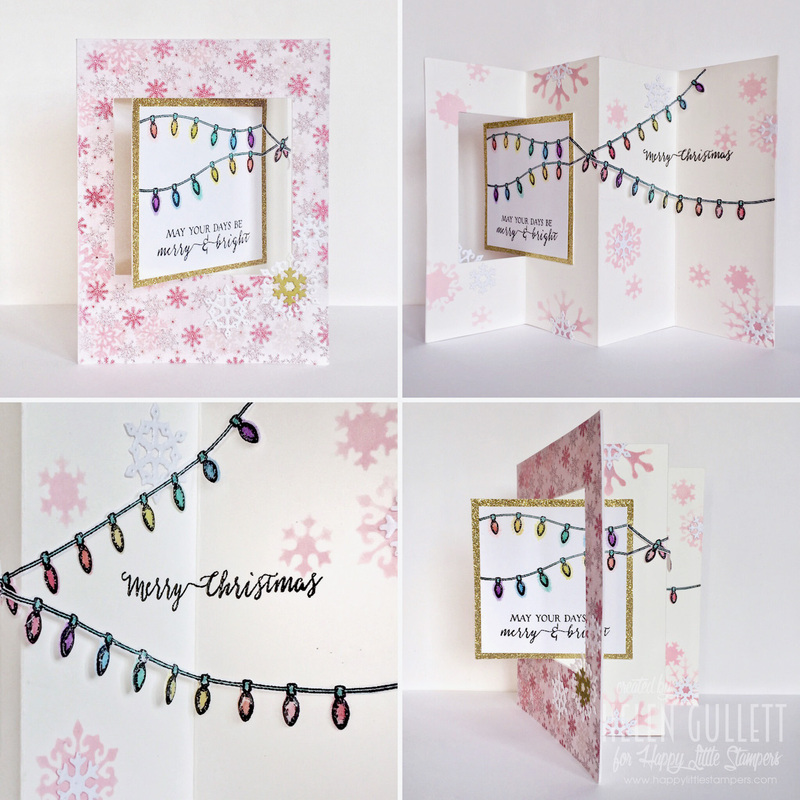 Using MISTI, I stamped the Christmas lights several times on a white cardstock, colored them with coloring pencils, and then I die cut it with the matching die. Once all cut out, I added some Liquid Glass glue on top for extra dimension on the light bulbs. Then I added the Christmas lights inside the card. I glued 2 string lights together so it would be long enough to reach the other side of the card. Thank You so much for stopping by and have a fabulous day! Love the design of your card and the colours are great! Thank you for sharing at CWS Challenge. What a fun card…love the cute stings of lights! This is a wonderful card Helen. I love the way the strings of lights go all the way from the outside to the far right edge of the inside. Very clever and fun. Thanks for linking up and playing our Christmas Challenge at AAA Cards. Thank you so much for visiting, Stephanie! I love this card – have never tried a lever card before. This card is so cool! Love the soft colors! This is fabulous. Sorry for the late comment. I would like to invite you to link with us again for our January Challenge at 613 Avenue Create. Have a blessed day!